The first public revision to the HG612 Modem Stats package has now been released. Click the Blue Download Now! button & choose one of the Download Mirrors. It is still currently aimed only at VDSL2/FTTC connections for Microsoft Windows users, but an ADSL version is on its way, combined with Linux compatibility. The package has been fully tested on XP, Vista & Windows 7 systems & although not perfect, some increased compatibility with problematic Windows 8's Task Scheduler has been built in. � Connection Up time & Total Bits loaded reported in the Bitloading graph. � More efficient/quicker harvesting/logging, especially for larger modem_stats.log files (mines now 202 MB (212,705,280 bytes) in size). � Ability to disable extensive event/error logging, just reporting the basics and any true errors (keeps the log file size down). � Ability to use a different task name. � The programs should now be fully compatible with the HG610, HG612 & HG622 modems. New users should simply extract the contents of the zip file to Drive C:, ensuring "Expand Folders" or similar setting is selected for a default setup. Existing users of the initial version 1.0 should extract all the files & subfolders to the relevant existing folders to ensure the slightly different operation of the package is picked up. Once all the files are in place, existing users should delete the original HG612 Stats Program task & create a new one via the Settings Editor. By default, Current (snapshot) data will be harvested & plotted every 8 hours, starting at 06:00 & Ongoing data will be harvested every minute, being plotted at 06:00 each day. These settings can be easily adjusted or logging and/or automated graphing turned off via the Settings Editor. Thanks ... looking good to me (I was already using your prerelease). In case it helps anyone with Windows 8 and its unreliable task scheduler (how did Microsoft manage to make it so bad), here is an XML export file of my belt-and-braces setup. I've changed the <Command> tag at the end from the very non-standard place I run it to the standard install location. You will need to change the Machine/user for it to work for you. Copy into an XML file, edit as needed, and import to Task Scheduler. It does not store the user password. One reason for failure before was that Task Scheduler sometimes forgets the stored password and so fails to start the task. The task does not need user credentials to run anyway. I was previously running with the original trigger, plus just one trigger on 'task creation/modification'. When I saw it had failed, I started it again by modifying the comments in the task. I've now added triggers on logon and connection to user session ~ that should (?) make it more robust. 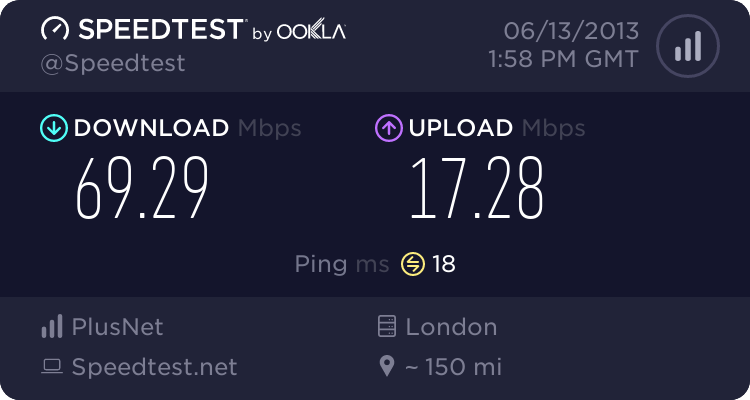 Moved (with trepidation turned relief) to BT Infinity 2 for upload speed. Happy BE user for several years.